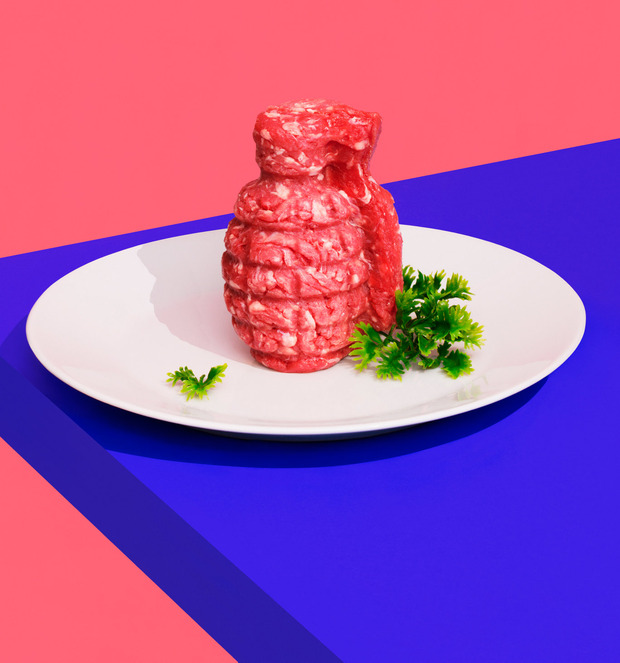 Still life image of a hand grenade made of raw mince meat on a white plate with garnish. The Taoiseach’s motto these days seems to be: “If it’s ‘in’, count me in.” So desperate is he to jump on every modish bandwagon, Leo Varadkar is rapidly becoming indistinguishable from RTE satirist Oliver Callan’s blistering mickey-take of him. Varadkar’s latest attempt to crash the Zeitgeist is by cutting down on eating meat – or “trying to”, as he put it rather pathetically. To quote Yoda from Star Wars: “Do. Or do not. There is no try.” He’s a grown man, after all. What he’s doing merely involves eating one thing rather than another. Let’s not pretend it’s some huge battle, like Christ being tempted in the desert. After decades as a vegetarian, I finally went full vegan a couple of years ago, so I should probably be pleased to see it gaining ground as a lifestyle choice; but there’s something so desperately needy about Leo’s wish to dine out, metaphorically speaking, on what he has for dinner, like a celebrity on Instagram. Does anyone really care in what form he takes his calories? By the same token, some of the annoyance which his announcement provoked last week was equally bizarre, not least Danny Healy-Rae’s intervention, as he declared that men who don’t eat meat have “never done a day’s work”. He made it seem as if manliness itself was under threat. To repeat: it’s all just food. To invest it with some kind of moral or physical superpower above and beyond that basic function is a mistake either way. The Taoiseach faced some fierce criticism from farmers and rural TDs for not showing full support to Irish farming, but what do they want him to do? The pharmaceutical industry is important to the Irish economy as well, but he shouldn’t have to pop Viagra tablets every day to prove he’s doing his bit for that sector either. That’s probably why Leo Varadkar let it be known midweek that he’d enjoyed a “very nice Hereford steak last night”, to mollify indignant Irish farmers. No doubt he’d rather have had a bowl of lentils, but what’s a Taoiseach to do? Farmers are big boys too, and probably shouldn’t take it too much to heart that some “right on” metropolitan wants to be seen as ahead of the curve; but in fairness, they are under pressure with prices unreliable and Brexit on the horizon. The last thing they need is for the Taoiseach to suddenly announce that meat causes cancer and is, like, totes bad for the planet. A French president who made similar remarks wouldn’t make it out of the Elysee Palace alive. But at least the Taoiseach, who said he was upping the proportion of plant-based foods in his diet for both health and environmental reasons, is being consistent with his principles, not least in light of a new report suggesting that people need to eat 90pc less meat in order to avoid climate change. Few of those who bleat most loudly about the damage being done to the planet by human activity have dared to acknowledge that their own behaviour will have to change in response. They’re like the young man in the Bible story who asks Jesus what he must do to enter the kingdom of heaven, and is told to go sell all he owns and give it to the poor, “and the young man went away sorrowful, because he had great possessions”. It’s the same with the eco-fanatics. They’ve also asked the god-like experts at the UN what they must to do to save the planet. Fly less often? Consider it done, we’ll just get to Tuscany in future by driving through Europe in our air conditioned 4x4s. Carbon taxes? We’ll write to our TDs straight away and demand that it be done. What’s that last bit? Give up meat? Seriously? And the climate change warriors did go away very sorrowful, for they had great love of bacon. It’s been the one effective way to separate the spoofers from those who are genuine about tackling climate change. If you’re always demanding that something be done about global warming, but won’t even change your own diet, then your every utterance on the subject should be discounted, because you’re a hypocrite, you’re just putting on a performance. And yes, Green Party, that means you. Some of these people will quite happily advocate the complete overthrow of the global economic system by Wednesday afternoon at the latest to stop further environmental damage, only to baulk at being asked to give up meat, insisting that, well, it’s actually much more complex than that and there’s no need to be hasty. Imposters, every last one of them. This latest report, published in the UK medical journal, The Lancet, probably goes too far in what it advocates. It would mean consumers eating the equivalent of half a meatball, one cocktail sausage and one and a half chicken nuggets a day, which would have been considered a feast in Ireland 50 years ago, when meat was much less prevalent in the national diet, but is unrealistic today, especially since the report also advocates cutting back radically on dairy. Bord Bia was certainly right to call the report “overly simplistic”, and to state that it fails to account for regional variations. Ireland is covered in grass. Turning that into protein by feeding it to cows, and then eating them, does make sense. There’s no point denying, though, that intensive farming does have a deleterious effect on the environment. Meat production takes up most of the available farmland globally, while accounting for just 18pc of the calories we eat, and it’s only going to get worse as the world’s population increases. In truth, it won’t make much difference what Ireland does. The burgeoning middle class in developing countries is increasingly able to enjoy luxury diets that were hitherto beyond their reach. That means more animals slaughtered than ever before – with the lowest estimates putting it at a staggering 56bn dead a year; that’s 150m a day, and that’s not even including fish – causing more greenhouse gasses to be released into the atmosphere than from every car, plane, train and ship combined. Shifting to a flexitarian diet, as it’s called, would make agriculture hugely more productive. At least Leo Varadkar is taking these warnings on board. Most consumers, perhaps daunted by the scale of the challenge, would rather turn a blind eye, trusting technology to ride to the rescue. To some extent, that is happening. Bord Bia has got behind the drive to “produce more from less”, and Irish dairy farmers are already the most carbon-efficient in Europe, with beef farmers in the top five. The Taoiseach eventually acknowledged all this good that’s being done, but only as an afterthought, which is definitely worrying. Unlike Irish farming, saving the planet is in neither the Taoiseach’s gift nor remit, but he still insisted to the Fine Gael parliamentary party meeting this week that climate change is “the next big progressive cause” they should be championing. Don’t say we weren’t warned. The only hope is it’s all an elaborate double bluff by the Taoiseach, by making vegetarianism so uncool that everyone rushes out and bulk buys Irish meat. Who’d want to belong to a club that would have someone like Leo for a member?